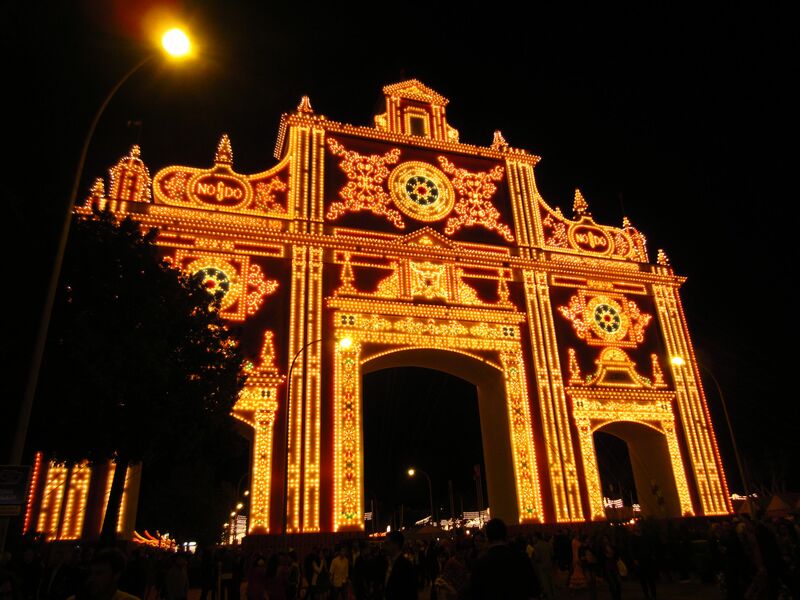 Walking into a magical place: Enjoying la feria de Sevilla! A few weeks ago I boarded a train (my first train in Spain) and watched beautiful landscapes as we speed on to Sevilla. 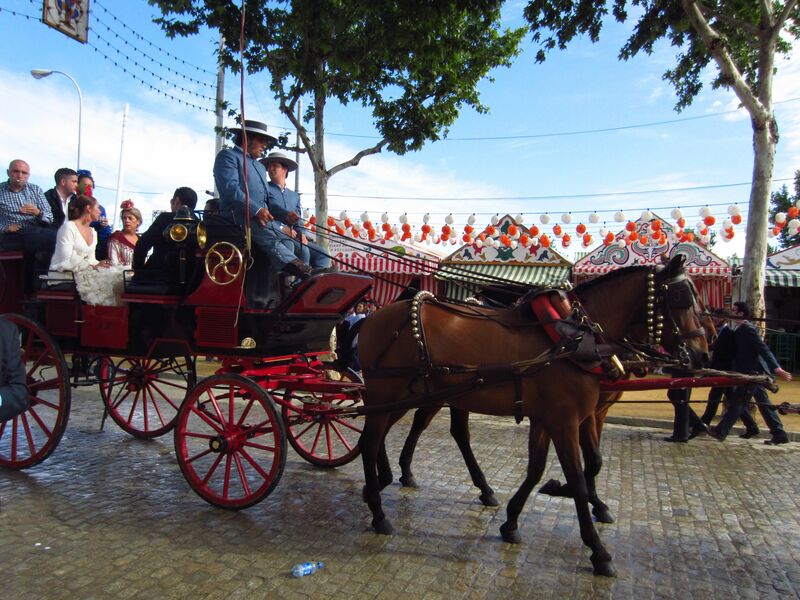 Sevilla is known to have the biggest fair in Andalucia and it’s no surprise since it’s the capital of this region. 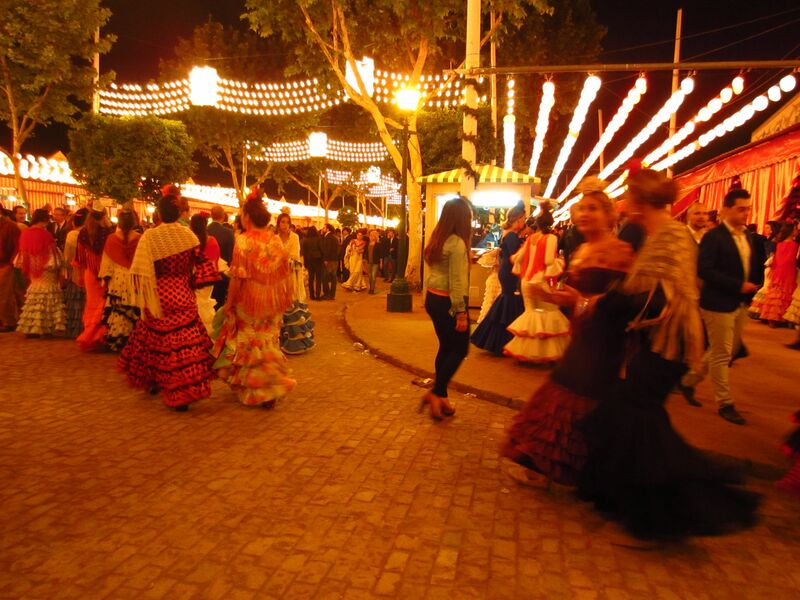 La feria de Abril (April fair) is a magical weeklong affair beginning on a Monday and ending the following Sunday. I arrived in Sevilla 5 hours later, was checked into my hostel by 9pm and got ready in my best guiri clothing, (ha),and anxiously waited for my friend to arrive. We boarded a candy cane striped bus, in feria spirit, and strangely we were the only 2 passengers on board. We arrived to chatter, colorful dresses, and lots of lights. I was giddy- Mira la portada (Look at the gate), lit up at night. How magical. I immediately felt we were in a magical place, transported to another time. We walked around and ohhed and awwed. I kept thinking, It’s like Disneyland… but in a Spanish sort of way with less emphasis on the attractions. Well. You get hte point. 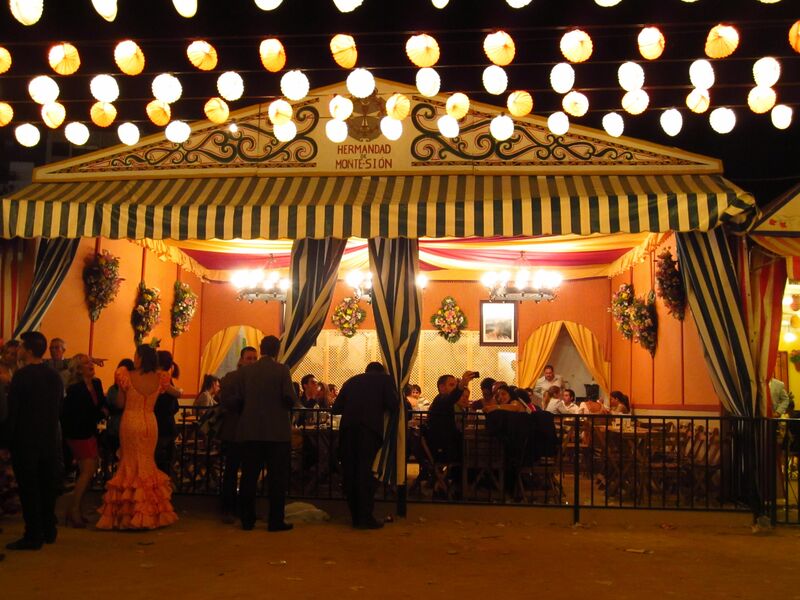 Most ferias (fairs) in Spain have casetas (tents), bars or discos are open to the public. 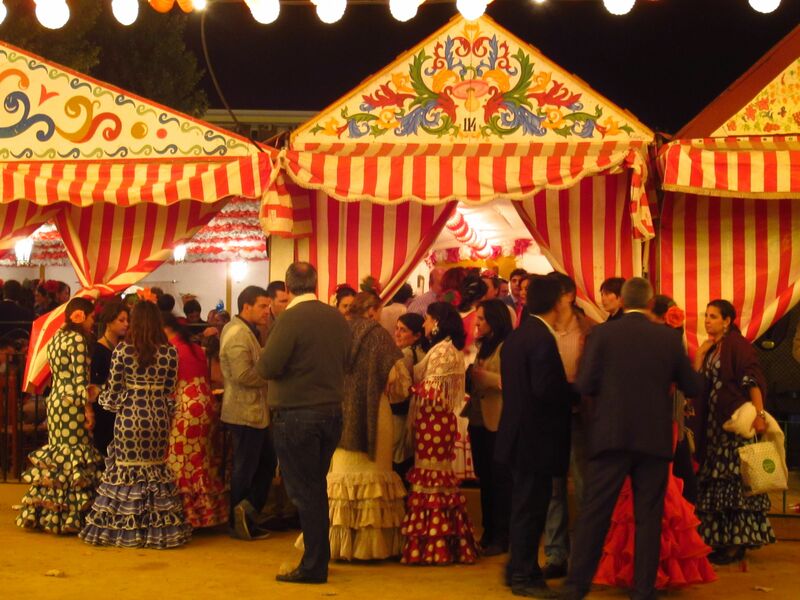 However, things are different in Sevilla, including the feria. Almost all casetas are private, you must be a member to enter and pay a yearly membership fee. The fees range from affordable to showing your status to have the privilege of entry. Drinks and food are not included with membership, you pay just like you would at any tapas bar or restaurant. After a few days at feria, it’s obvious it’s all about drinking, eating and enjoying time with friends and family, la vida Andaluz.From an outside perspective, it seems elite to pay membership to have access to have a place to drink, and to be apart of a community. Yet Sevillanos are known in other parts of Andalucia having a snobbish air about them and with an attitude of being la créme of the créme.There is no doubt there is a lot of wealth in Sevilla, and no matter where you live, people with money like to display it- Feria is a perfect opportunity! My excitement momentarily faded, and then I had I mission: Get into a caseta privada! I had no idea how but I knew, somehow, someway, I’d make it happen. Truth is, having been there are public casetas but I always want the local experience. 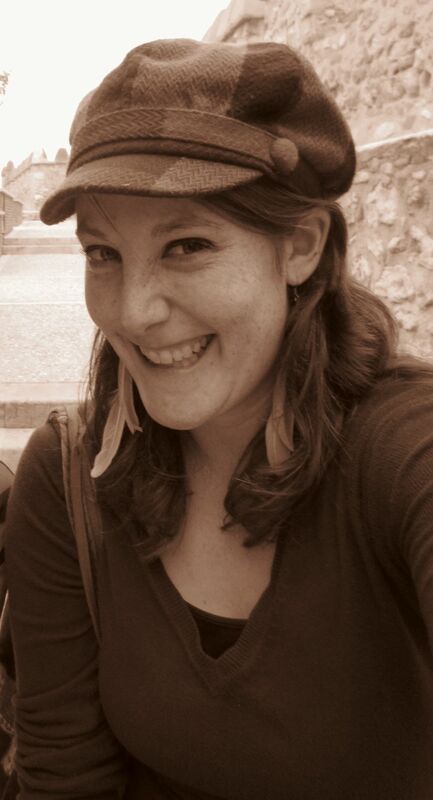 A few days before I contacted another blogger, Cat who lives in Sevilla and a feriante (loves feria) asked if she’d be interested in meeting and told her my mission. We exchanged contact info and planned to play it by ear. 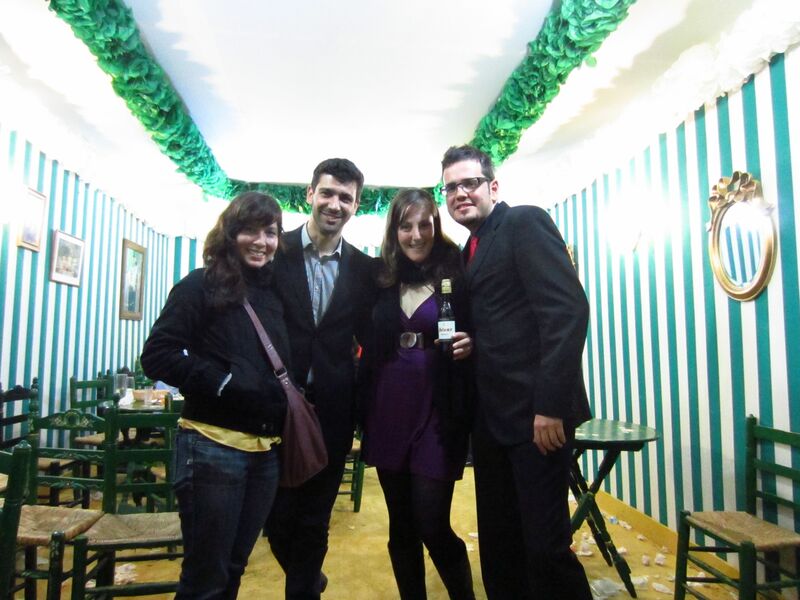 The day I left for feria I responded to a post on Couchsurfing “whose going to feria? and added my name and number. Within a matter of hours, while on the train, I received many texts from CS feria gooer’s, who were telling me their plans. I didn’t agree to anything but one message from a Spanish guy, who had Sevillano friends and was confident it “will be a good time.” I had an inkling he could be our answer to getting into a caseta privada! Angelica and I roamed the fair till 2am (so much for “un rato“), watching feriantes and checking out the rides and greasy food. Angelica and I shared a deep fried chocolate covered churro. Fried goodness is always delicious. After our walk around, we hear from the CS’er whose also disfrutando (enjoying) la feria and we meet up amongst the crowd, enjoying Rebujito, a mix of Manzanilla sherry and 7-Up, drinking out of plastic shot glasses. After many tiny glasses of Rebujito sipped slowly, with a headache slowly developing, we plan to call it a night but it’s still early by Spanish standards- the sun hasn’t come up; so off we go to another caseta. Vámonos! By 4am, we finally make out way to the hostel, via the longest bus route possible. 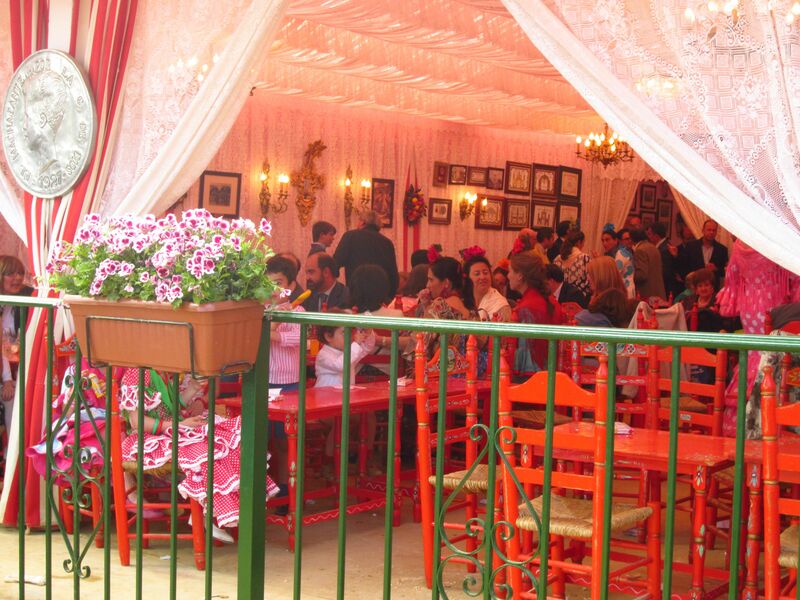 The next morning, we plan on 3 things: café, lunch and going back to la feria to see it by day. By the time we find a lunch spot and arrive to feria it’s already 5pm and our only plan: take a wander. And see all the horses and carriages because it’s a horse show by day- wealthy Sevillanos who own horses parade through the streets. Mom and kids! How cute are they!!! 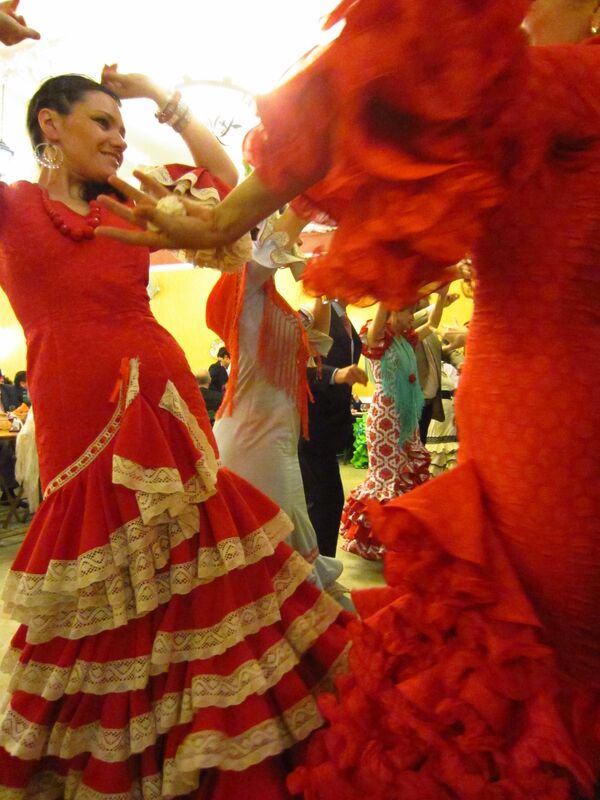 Sevillanas (Seville women) dress in colorful curve hugging dresses that flair and ruffle around the knee, known as traje de Gitana (gypsy dress; this dress style is typical of Flamenco dancers, which has it’s roots from Gypsies). 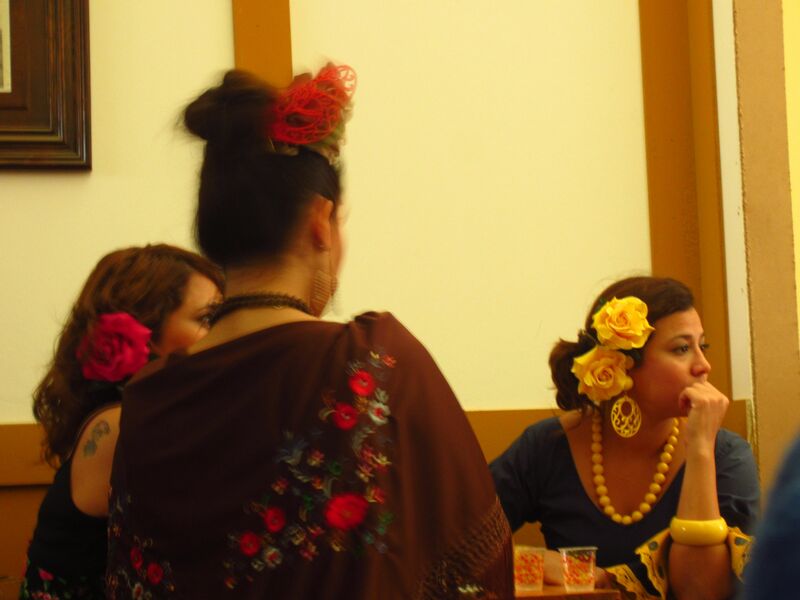 Sevillanas pride themselves on their traje de Gitana and the fair is their opportunity to shine- often wearing a dress during the day and a different one at night each day of the fair. 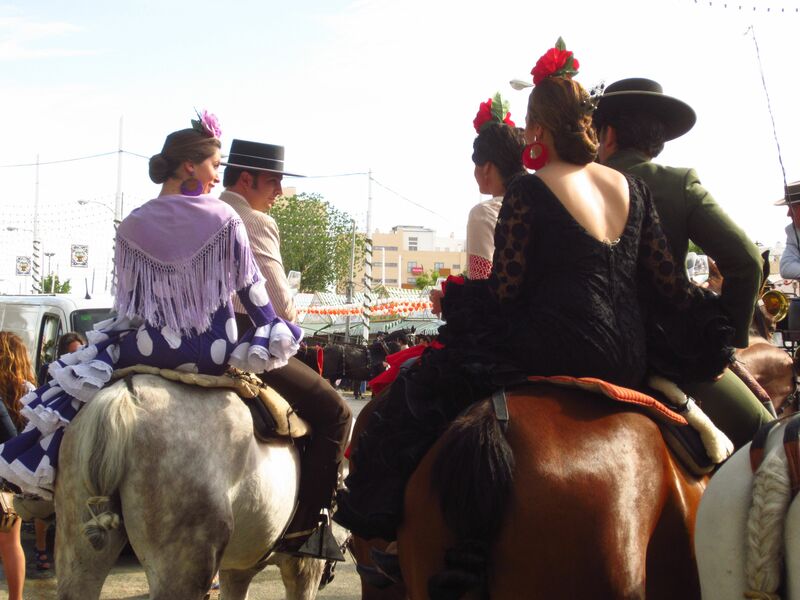 As our visit to Feria was approaching, I got nervous wondering what the heck I was going to wear. I didn’t want to shell out money to buy a dress, known as traje de Gitana or have one tailored made for me months in advance. 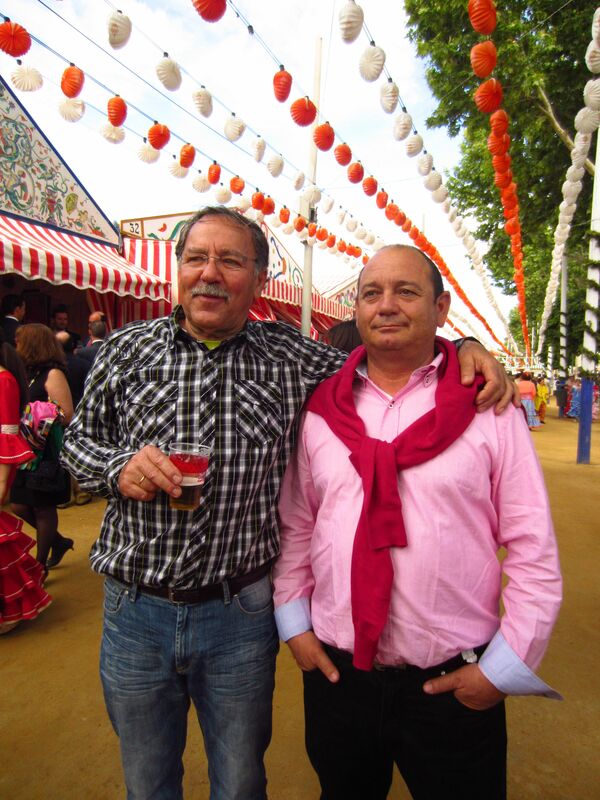 To be honest, traje de Gitana is not my style but it certainly adds flair, festivity and a sense of a different era to the fair. It’s what makes la feria de Sevilla so special, it wouldn’t be the same without colorful ruffled dresses, a big flower (most) place on top of their head, (which looks silly, don’t know Why it’s the style but it is), big colorful plastic earrings and scarf. Angelica and I came as we are- in our own style, obvious foreigners and were fine. But I know if I lived in Sevilla, I’d have at least one dress with all the accessories. It’s always fun to play dress up and get into the spirit. While snapping our photos and taking everything in, no less than 20 minutes had passed when two men who could be our fathers, drunk from all day drinking, engaged us in conversation by asking us to take a photo of them. They joked they were gay but it soon was apparent that was their in to small talk. They started aruging after one suggested inviting us for a carriage ride. I listened attentively, thinking maybe this is our lucky chance while and one of them started calling someone he knew to arrange a carriage. In the end, they invited us for a drink instead- more rebujito and our third caseta privada. So much for seeing the fair by day. Rain clouds had been forming and thankfully, we had shelter while it drizzled outside, practicing our Spanish, enjoying Flamenco music and seeing women and men dressed to the nines. I was getting antsy and ready for more exploring, just then I heard from Cat. She invited us to a caseta owned by a friend to enjoy some, you guessed it, more Rebujito, the drink of the fair and some food they had ordered. 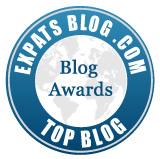 (Membership: 1000 Euros.) Lucky us to be guests in a small caseta with a homely feel. 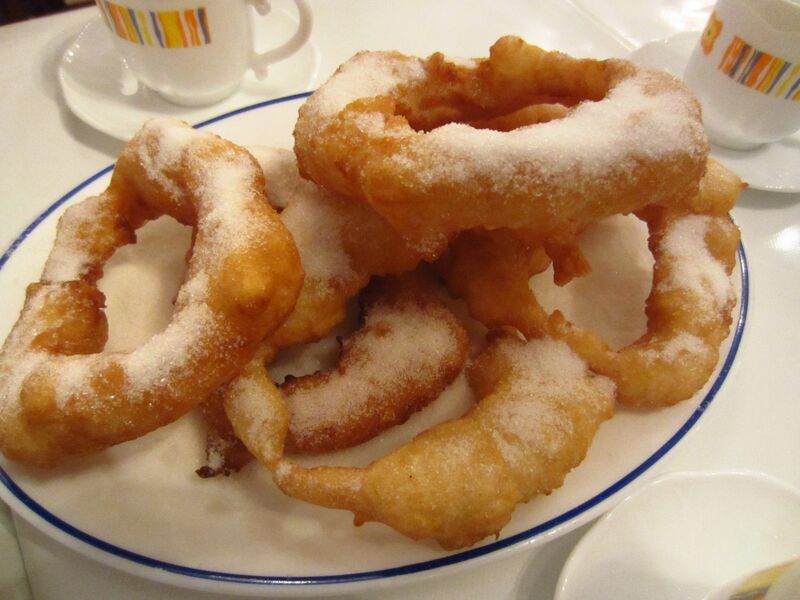 Dusk was upon us and it was time to sample fried dough dipped in thick chocolate, similar to churros. After our intake of greasy goodness, we all snuck into a caseta to use their amenities and enjoyed a beer, for a change of pace before making our way to Cat’s caseta, where she is a member. The door man was kind enough to let us in, one member and her four friends. Her member usually only allows one guest. This caseta was big, double or triple the size of others we had been in and since it has more members, yearly membership is affordable at 75 Euros. We ordered drinks and I watched on as Cat and her friends danced Sevillana. I love capturing the twirling fabric. After some time, Angelica and I were ready to check out the rides. We have to go on at least one. We said our goodbyes and went in search of the most “make -your -stomach -queasy attraction, paid for our ticket and got on. Afterwards, we both agreed it was time for greasy food- a hamburger for Angelica and a kebab for me- typical feria food in Spain but not so easy on the stomach. I should know better but can you really go to a fair without eating the tasty junk? Nope. We called it a night at 2am, this time we asked if there was a better bus to take but in the end, we ended up on the one we took the night before. Exhausted, we quietly walked home and crashed on our beds to the sound of dude snoring loudly.Oh hostels. We awoke the next morning ready to see Sevilla, still groggy from the festivities only hours earlier and full of good memories. You can get lost in time in Feria… and though I only spent 2 days at the fair I understand how easily feriantes spend the entire week there and now that it’s over, they’re already thinking of next year. It’s a magical place. i just imagined what it was like to be at this fair. 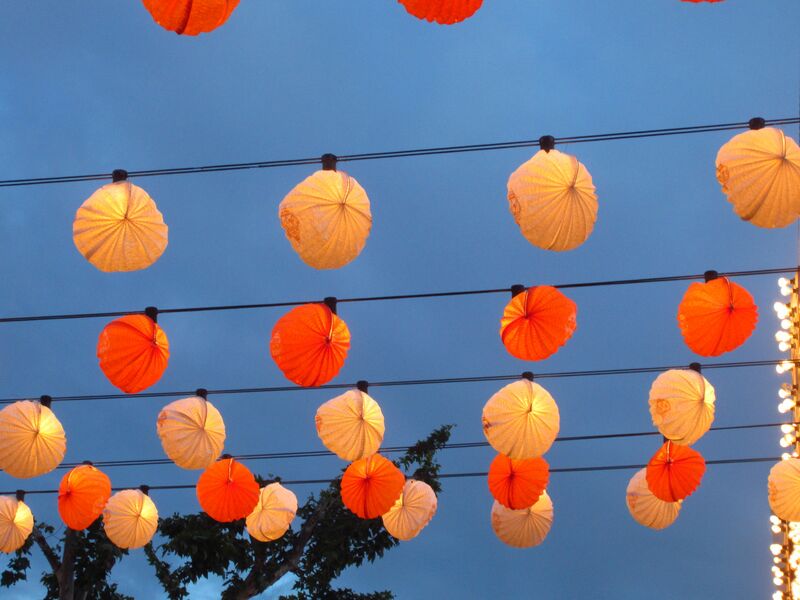 Pingback: Rain at the Feria « ¡Hola Yessica! 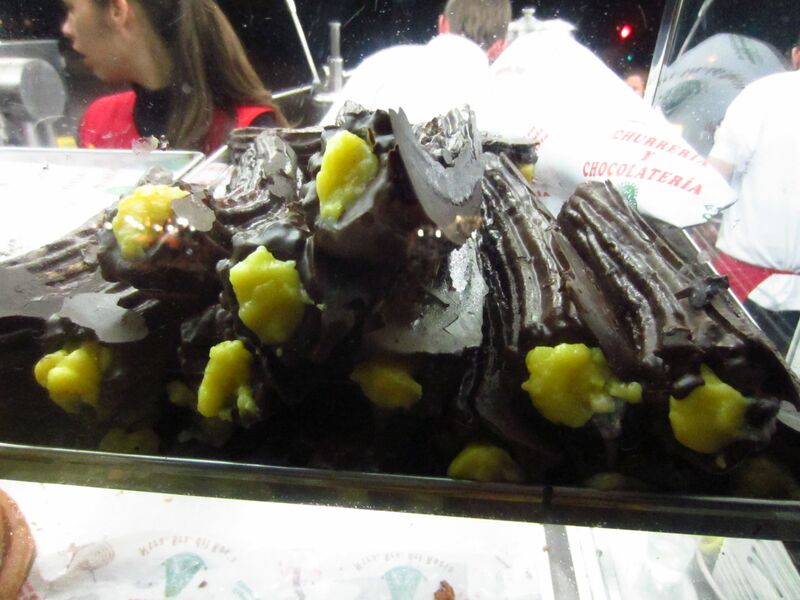 Those chocolate covered Churros look sinful. Yes I am a sinner 🙂 Do you own a Flamenco/Gitana dress. I think I’ll get married in one… if that day should ever arrive. 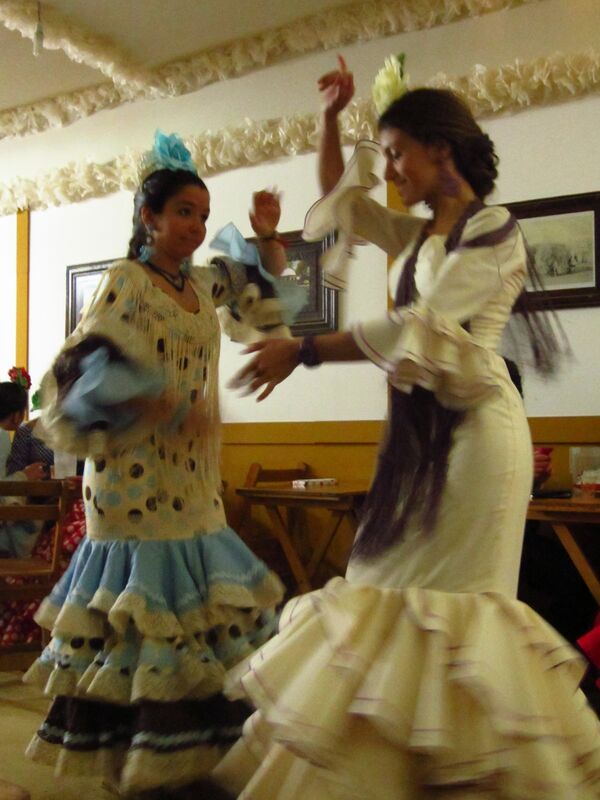 I don’t own a Flamenco dress but if I lived in Sevilla or was going to be in Spain longer, I would invest in one! You’re funny- that would be fun to wear as a wedding dress, Why not? Those costumes are gorgeous. I’d love to attend something like this. thanks for reading. I hope to go back! Amazing!!!! 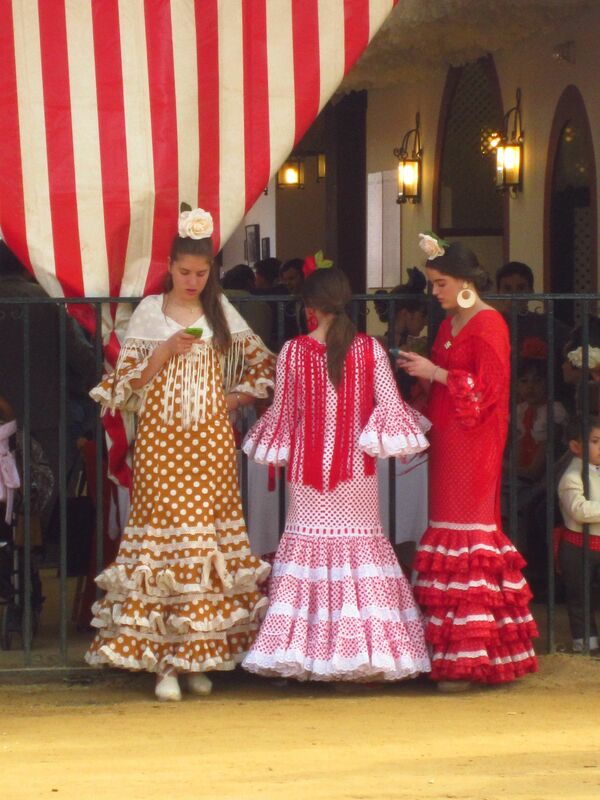 I LOVED this, the color, the culture, the elitism, the costumes, everything! I’ve never seen anything like this (and never heard of), and have always wanted to go to Seville. I’m so glad you had an amazing time and celebrated in style! Chocolate covered churros OH MY GOD!! Great post, Lauren! Thanks for the compliment. 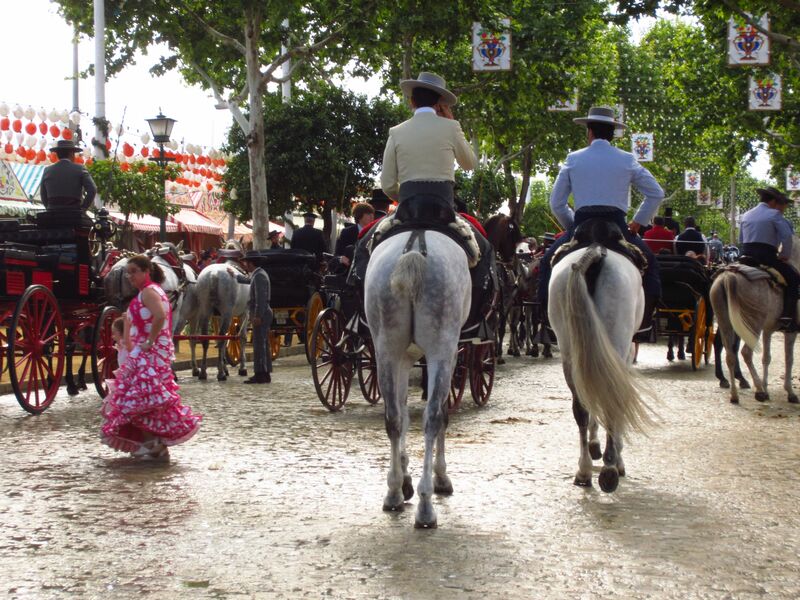 The fair in Seville is definitely something to attend. 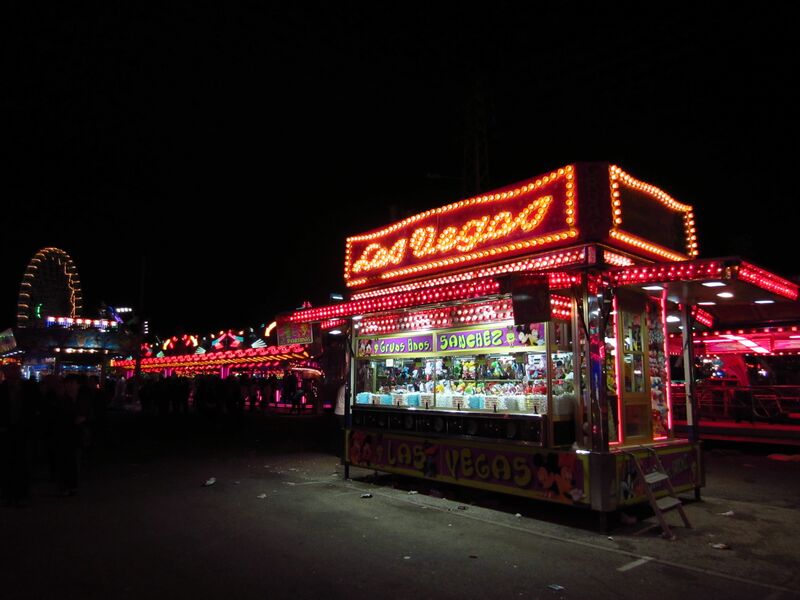 I had no idea about the fair until living in Spain! The beauty of being abroad. Love living it over again, and do happy you enjoyed yourself!!! Live the photos in my caseta. I loved this post! Reminds me of the old days 🙂 I was SOOOO hoping to see a picture of you in one of the Seville dresses!!! You have to get one and take a picture! Now! 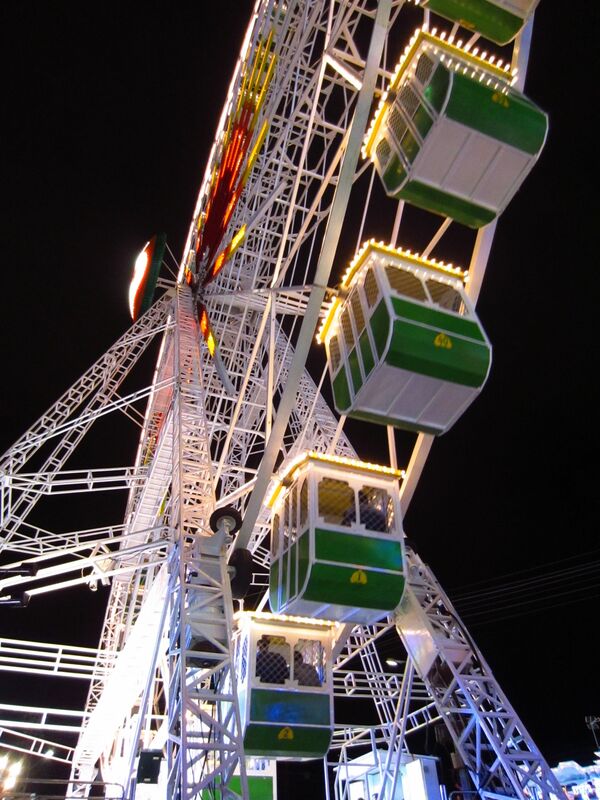 I loved all your pics as well, especially the Ferris Wheel! Amazing! Ah thanks. It took me a while to write this post and choose the photos. Yes, the dress definitely makes it and next time, because their will be a next time, I’ll have a dress! 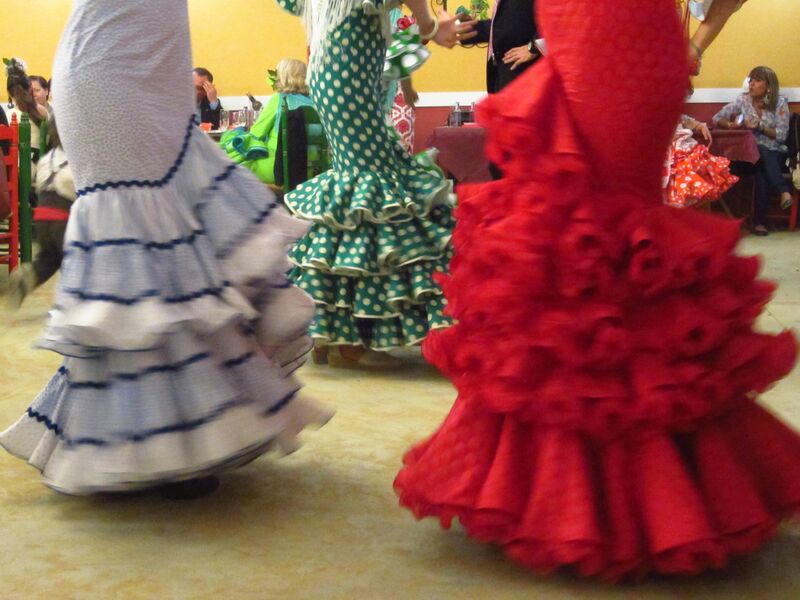 I’ll be a “Sevillana” for feria! Thanks for the compliments on my photos.